We believe you’ll benefit as a coach when you experience coaching as a client so, as part of your certification, we are giving you an entire month of coaching FREE! Just choose one of the coaches we recommend here and sign up using the promo code from your Coach Settings. 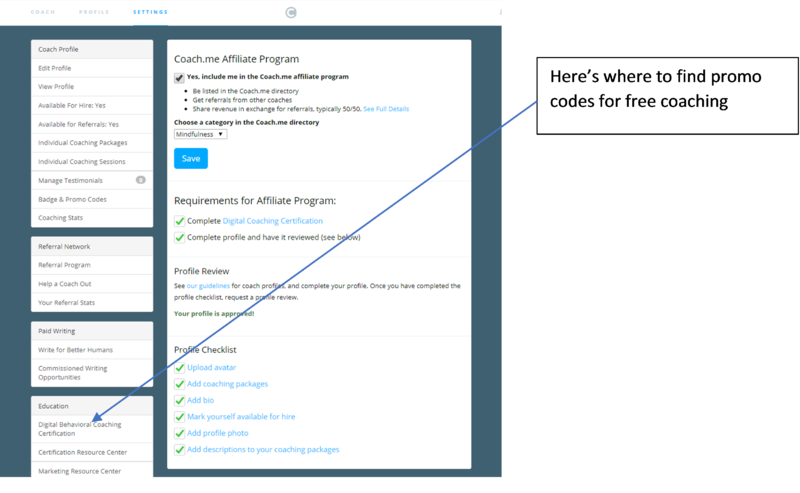 If the coach you choose offers higher priced coaching, select the option for standard-priced coaching at $64.99/month (the promo code won’t work on other packages). A word of advice – The purpose of this free coaching is for you to experience being a client, not for your coach to talk about being a coach on Coach.me. Let go of any expectations that your coach is going to help you set up your coaching practice. The purpose of this coaching relationship is to help you improve an area of your life by successfully building a habit or completing a goal. Once you’ve completed coaching as a client, ask for a transcript review.